Progression and sequences of poses will build skill and understanding, from pose to pose, and class to class. This precision in action emphasizes correct alignment of the body within poses, building strength and stamina, balance and flexibility, and a renewed sense of well being. Eastern/Western views of physical and subtle support, can enhance sequencing of props and poses to heal and balance. Stress that continues without relief can lead to distress – a negative stress reaction. Distress can disturb the body’s internal balance or equilibrium, leading to physical symptoms such as headaches, upset stomach, elevated blood pressure, chest pain, sexual dysfunction, problems sleeping and emotional problems. These include depression, panic attacks, or other forms of anxiety and worry. Research suggests stress can bring on or worsen symptoms or diseases. This series is available as series and individual classes. The depth of this program is widened by the classes that you take, and developing a home practice. Modifications for individual students will be provided with yoga props, to allow investigation for all bodies. We will learn to rest deeply, releasing the body and drawing the mind towards a joyous quiescence within. Standing Poses for Hamstrings & Legs – Standing poses form the basis of yoga practice to develop stability, flexibility, lightness and balance. They strengthen the legs, and create a foundation of the feet, allowing us to extend from that base. The poses build strength in the pelvic and shoulder girdles, creating a structure of support for the spinal column. 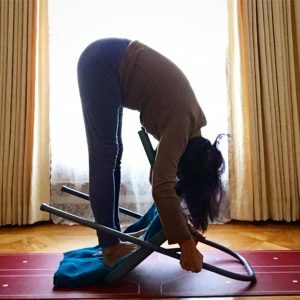 Learn tips and techniques to help you develop a lifetime of practice, and modifications for ageless practice. 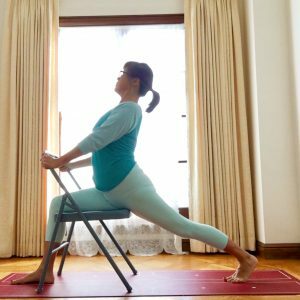 Seated Poses for Knee, Ankle & Feet – Seated poses stretch muscles of the spine and legs, which help release tension and increase flexibility. They strengthen and tone core muscles of the back and abdomen, and create freedom in the pelvic area to help prevent strain on the lower back. We will explore a variety of poses including twists, core strengtheners and forward folds to tone abdominal muscles, lower back, oblique and upper thighs. Inversions can be seen as the epitome and centerpiece of yoga asana. They offer physiological benefits of working against gravity and the freedom of changing the relationship of body bearing weight. Inversions help to increase blood flow and circulation, calm the nervous system, and relieve stress. They can enhance mental clarity and emotional stability. The body upside down changes directional blood flow, which boosts major body systems including circulatory, respiratory, nervous and glandular, and gives a rest to the heart. Headstand and shoulderstand will be taught in this session. Shoulder Openers & Backbends – Physically, backbends open the hips, strengthen and stretch the legs and lower back muscles. They tone, lengthen, and increase blood flow around the spine and diaphragm, which helps boost energy, relieve tension in muscles and release natural endorphins and hormones. Backbends offer a profound exploration of our selves within a physical experience integrating the body with the mind, senses, and breath. Freedom of movement in the shoulders expands the ribcage and improves respiratory function. B.K.S. 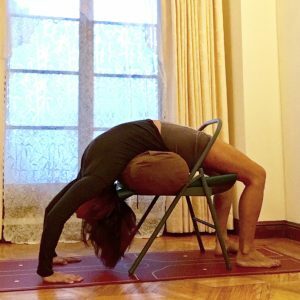 Iyengar recommended backbends for depression and as a holistic alternative for heart patients and ischemia. 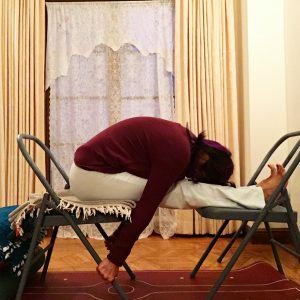 Forward Folds – Forward folding poses help to provide a feeling of sanctuary and support, which calms the brain and helps relieve stress and mild depression. They promote total exhalation of air from the lungs by compressing the chest which helps to calm down the mind. 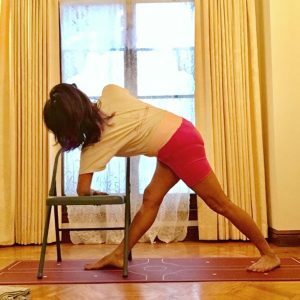 Forward bends open up the back body, lengthens and strengthens hamstrings, inner legs, spinal muscles, ankles and knees. The asanas mimic the shape of the body in the womb (primary curve), providing a physiologically nurturing support, which aids in working with anxiety and grief. Twists – Twisting poses develop flexibility in the spine, increase circulation and help to cleanse internal organs. They work to compress the internal organs and glands of the torso, forcing out metabolic-waste. B.K.S. 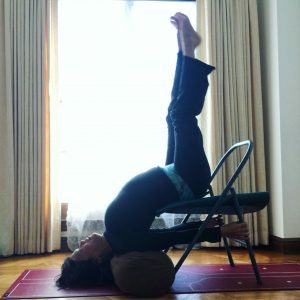 Iyengar, describes twists as a “squeeze-and-soak” action, similar to wringing out a wet towel. The organs are compressed during a twist, pushing out toxins, which allows fresh blood to carry oxygen to heal and rejuvenate the body. Twists can give us an instant energy lift and decompress the vertebrae in a safe healthy way. They work to reduce stress and anxiety by quieting the “monkey mind”, and bringing attention into the present which slows and calms the mind.